A bun so good it deserves to be pictured from all angles. 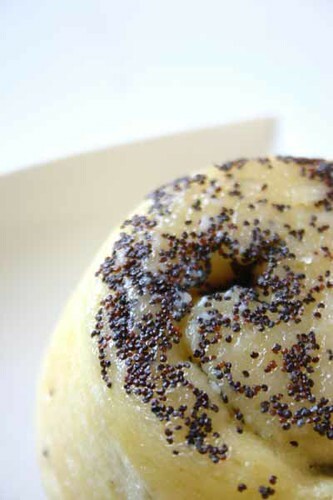 From above, poppy seeds abound. Many people have their rituals at breakfast, many of them are simple, some eloquent. But when merely getting out of bed is an uphill struggle, morning rituals are the last thing on my mind. I usually falter out of bed after a short wrestle with my doona, then sleepily make my way to the kitchen, stare blankly into the refrigerator for a few minutes, close it, then open it again, find nothing and then just stand in the middle of my kitchen for a really long time. That’s probably as ritualistic as I get. I have never been one of those people that leap out of bed bright-eyed and primed for the day, I am usually barely-conscious and half-baked. A friend says she usually needs her 8 hours of sleep to function properly, I honestly think I need at least 13 hours to even be close to fully operational. But the chances of this actually happening are slim, very slim. When it comes to the perfect breakfast, many times the busy life causes us to neglect it. I really do love breakfast as a meal but I rarely have time to sit down and actually enjoy it. Many a morning is spent hastily slopping some yoghurt into a bowl and eating it while getting dressed. It has come to a point that when we want a decent breakfast we are forced to go out and actually find it. We’ve gone out on many breakfast dates, or in my case brunch but rarely do we ever get to indulge in great breakfasts when at home. And really, it’s a shame that we can seldom enjoy breakfast in our own home. But I guess that is what weekend mornings are for, they allow us to recapture the breakfast that eluded us during the weekday. 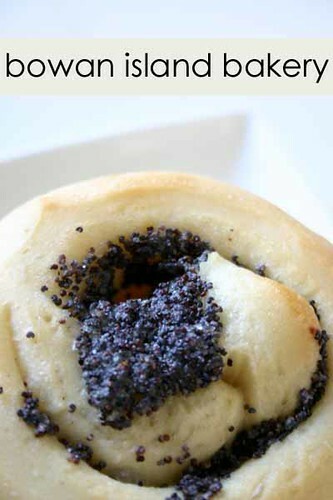 The bun unravelled; flecked with poppy seeds. Well this brings me to Bowan Island Bakery and Café. I have always passed this bakery on my way to the weekend markets and have heard plenty of good things about it, but never stopped in to see for myself. When I did decide to make a quick visit, it was a sweet surprise. The café sits along the uninspiring stretch of Victoria Road in Drummoyne, although when inside it feels completely removed from the bustling city outside. Inside, the café feels like a small town bakery somewhere in the Irish countryside; although it was actually Vancouver that inspired the founders of Bowan Island Bakery into bread making. 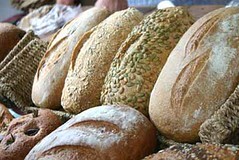 Bowen Island itself is situated off the coast of West Vancouver and after learning the art of sourdough during their visit, David Cummings and partner Richard Wong decided to start the Bowan Island Bakery here in Sydney. The great thing about Bowan Island is that they hold fast to traditional bread making practises; there are no machines, no preservatives, everything is made by hand using a 60-year–old culture. Aside from selling various artisan sourdoughs and soda breads, of which I am yet to sample; they also sell small muffins, cakes, pastries and sandwiches. 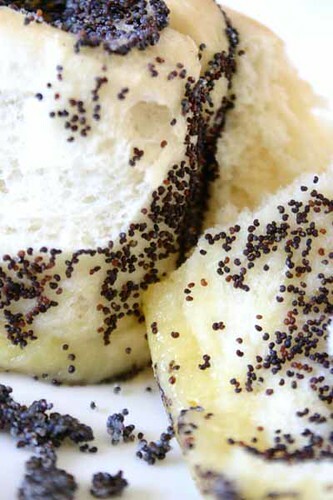 My personal favourite and one that I have always been going back for is the Orange and Poppy Seed Bun- a soft and moist citrus bun, speckled with poppy seeds inside and out. 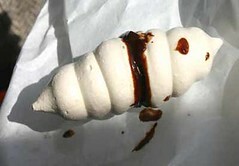 I absolutely adore this bun; I have been to the bakery several times and I am yet to be inspired to purchase anything else. I just can’t seem to shake off this bun and this is nothing against any of their other breads, they look and smell wonderful, perhaps even better but this bun I just cannot get enough of. The taste is smple and really summons no sort of immense palatal euphoria, but it’s the unpretentious nature of this bun that makes it so good. From beneath; the citrus syrup at the bottom and more poppy seeds. So after a quick pit stop to Bowan Island after a night shift, I took some of these buns home to enjoy for breakfast. 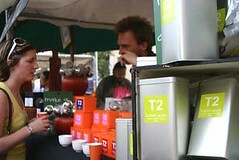 It was nice to be able to sit down and savour every bite with a hot cup of tea. I have this ritual of eating the buns where I first take a few bites off the top, and then proceed to unravel the bun eating the fluffy seed-flecked interior. I leave the moist syrupy base for last as it's my favourite and slowly tear away small pieces making sure to relish every morsel. I could happily make this my morning ritual any day. I also bought a Raspberry friand from the bakery although its presence was eclipsed by my adoration for the bun. 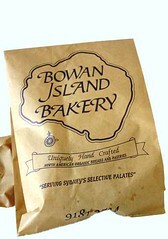 Perhaps next visit I can expound on the other selections on offer at Bowan Island Bakery. But for now, the bun takes the spotlight. I don't normally make snide comments towards other people; I am usually a kind person. However yes, I can be a little judgemental at times and I am capable of making snide remarks about others but forgive me, I am after all human and female. I am certain that there must be some unidentified gene built into the female DNA to compare and judge others, especially fellow females. So I apologise now if I offend anyone, but I must get this off my chest; confessing is the only way I can allow myself to move on from this one peeve that has irritated me for years. The thing that has always irked me a great deal are women who wear incapacitating shoes. I mean, for the love of Manolo Blahniks, please stop! Now this is coming from a girl who loves her shoes; the kind of love that knows no monetary bounds and the kind of love that causes you to lose all financial self-control. As one who has worn and traversed many a footpath in anything between ballet flats to stilettos and as one who has learned her lesson after being beset with blisters, I don’t know why women still walk around in debilitating footwear. Now this is nothing against stilettos or anything over three inches; I am quite short so I will take every inch I can get but if you can’t run from a gun-wielding manic on the streets in your stilettos, please don’t wear them. Consider something with less altitude. If you are thinking this is coming very left-field; yes it is. And some might be under the impression that the only reason this blog exists is to facilitate and air my vexations. well yes, there might be some shred of truth to that but usually most of my complaints are accompanied by pretty pictures of food so really what are you complaining about? 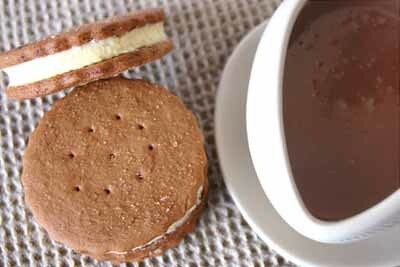 So yes I am talking about incapacitating shoes but here are some photos of cookie sandwiches, happy? Back to the shoes- this is how the whole matter exploded and came to be poured out onto this unsuspecting blog (and audience). I was running late for work and was hurtling in and out of traffic making some really good time considering I was already a good fifteen minutes late. I reached a traffic light and the light turned green, so of course speeding off was the only thing on my mind. But to my intense frustration I could not go because a woman carrying two full bags of groceries had decided that she would cross the street, in the middle of a green-light. Not only did she cross in mid-green (for motorists) and during peak hour traffic, she also took her sweet time. It appears that crossing the road carrying two bags of groceries whilst wearing a pair of wedges only permitted her the slow gait of a kimono-clad Geisha. So not only was she crossing the road at the most inopportune time but she was also wearing footwear that was severely inhibiting the length of her stride. I don’t know if she just didn’t have the adeptness or dexterity to walk in those shoes but please do not wear shoes with a high difficulty rating while shopping for groceries, particularly if you are planning on walking home. 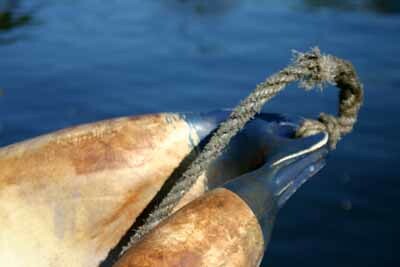 You will not only imperil yourself but also impede the people around you. So please women (and perhaps some men) I ask you, I even beseech you to consider common sense when it comes to footwear. You will not only save yourself some time but also help others not to be so late. It seems that shoes and cookies are a recurring theme on this blog but now that I have aired my grievances and hopefully saved a lot of people from seeking the services of a chiropractor, I will move on to the cookies. Just like shoes, I have this thing for cookies, especially when transformed into a cookie sandwich it becomes a double delight. Lately I have found myself searching the archives of this incredible blog and using it as a resource for unique and classic recipes. So understandably when I found a post about Heidi’s nostalgic longings for Graham Crackers in her archives I knew I had to try them immediately. The recipe does require some time to complete as that the dough needs to rest in the fridge and there is quite a bit of rolling, shaping, cutting and pricking that needs to be done to the cookie dough before they go into the oven, but if time is in your favour do give this recipe a try. I started off making rectangular ones, although they turned into these amoeba-like figures so I used a round crinkle cutter instead. The results were much more favourable using the cookie cutter but I think this is just because I couldn't cut straight rectangular shapes. Heidi’s grandmother’s Graham Crackers were filled with cream cheese frosting, although right now I have this fixation on mascarpone cheese, so I replaced the cream cheese with mascarpone. 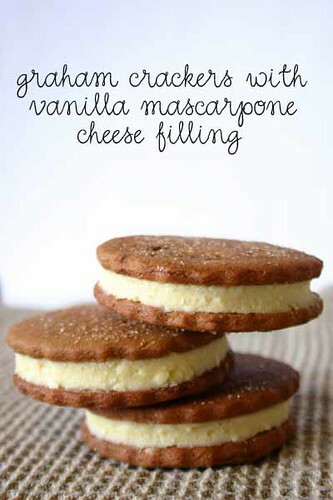 This variation still worked well and they still tasted divine. Now I feel I must warn you, these cookies are fairly heavy duty especially when they are filled, so don’t go too gung-ho on them as you might feel very ill afterwards. This is the time to apply the adage less is more. After one or perhaps two cookies they are the perfect way to satisfy a sweet tooth, so make sure you share the rest of them, the recipe yields enough for a small army. 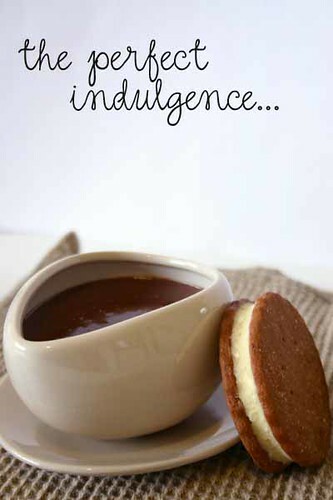 With a hot cup of thick creamy hot chocolate, these cookies sandwiches are a luxurious treat for the senses. All gastronomes in Sydney are anticipating with bated breath, forks in hand and palates salivating for the imminent arrival of this year’s Good Food Month. The month of October will be jam-packed with food festivals, events and courses; so if you are a Sydney-sider or in Sydney during this time make sure you take advantage of the good food on offer. Go here to see the calendar of events. Apart from the great courses, menus and food tours on offer, there are also outdoor events scheduled throughout October that have free entry. When presented some free time while en route to a BBQ, we decided to make a quick pit stop at Newtown's Feastability Festival held last Sunday. I did the snap and dash, as that not only did we already have an imminent BBQ to attend, but I also have an aversion to large crowds. I wanted to get out of there the minute we arrived; I snapped away at some of the stalls quicker than Spedey Gonzales could cry "Arriba Arriba!" and quickly dashed off to our next engagement. If you have read this blog for long enough you will have encountered my several grumblings about crowds. I just don't like them; I hate the shuffling at ten paces per minute and the meandering through tight, throng-filled thoroughfares. I love people but when you put them in a crowd, they begin to drive me crazy, especially when the crowd is a greedy and hungry one. I never faired well at Disneyland, at the Olympics or at the Royal Sydney Easter Show and my friends have severe doubts as to whether I woud survive going toJapan or perhaps India without turning into a raging mess. I realise this is one aspect of my usually genial personality that needs some improvement, or else you just wouldn't be able to take me anywhere! The global population is increasing exponentially and so it seems that it is I that needs to evolve; by the looks of it crowds are here to stay. Assorted miniature cakes from Caketown. 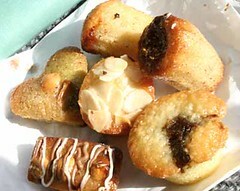 From top: Raspberry, Fig, Date, Hazelnut, Pistachio and Hazelnut; Centre: Almond. When given the opportunity to meet fellow food blogger Swee San of A Self-Proclaimed Foodaholic, I wasn't going to send the monkey on my behalf. Sure enough he’s cute and in addition to that, he is the virtual face of Milk and Cookies, however for this assignment the attendee simply had to be none other than yours truly. Not that I ever doubted the monkey’s social aptitude, he is actually quite the charmer but it was more to save Swee the embarrassment of sitting across from a plush toy in fashionable and crowded Bondi Beach. Jest aside, it was refreshing to finally meet another food blogger. At least this time I knew I wouldn’t get strange looks from fellow diners when I took a camera out to photograph my meal. Although, according to Swee we did get looks from the adjacent table, but who cares what they thought. It was just nice to be able to talk to another person about blogging, baking and everything in between. I learned a little about Swee and about cheating puff pastry; I don’t think any other encounter would have resulted in such wisdom gained and so for that I am grateful that I had the opportunity to meet her. 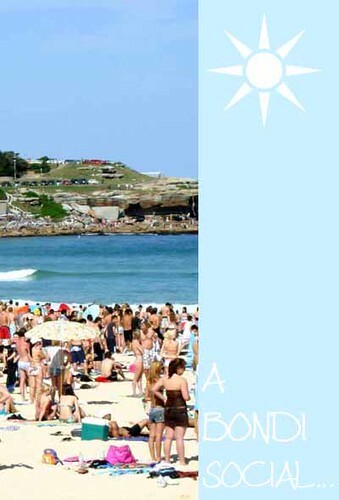 Iconic Bondi Beach was the location for our meet-up and it couldn’t have been more perfect. For lunch we defiantly opted for the breakfast menu at Bondi Trattoria. Swee wisely went for the poached egg, potato pancake with smoked salmon and spinach (14.50). 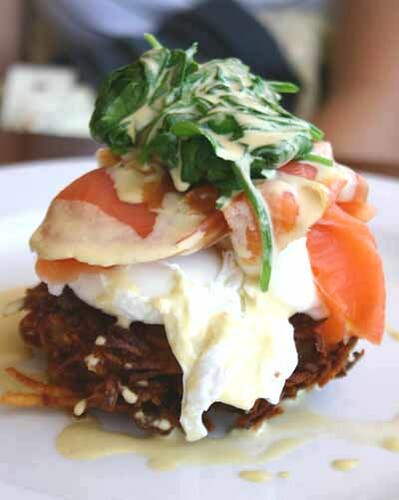 It was a perfectly stacked serving of thick hash brown and poached egg topped with smoked salmon and spinach. I naively went for the Breakfast Pizza ($15) expecting a dainty sized pizza with ample toppings; what I got was a large (8-slice) pizza instead. Before you start making your own conclusions as to the fate of all 8 slices, I did share some of them and took the rest home for my dog. I was initially planning on eating the rest later but after a day of being at the beach and in the sweltering car, I thought the pizza would be better appreciated by my dog Jack, who has in fact becaome somewhat of a stale-pizza connoisseur. Fortunately for him no one in the household likes cold pizza. 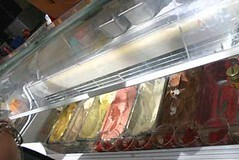 After having some grub and conversation, we decided to make our way to Pompei’s for some gelato and more conversation. 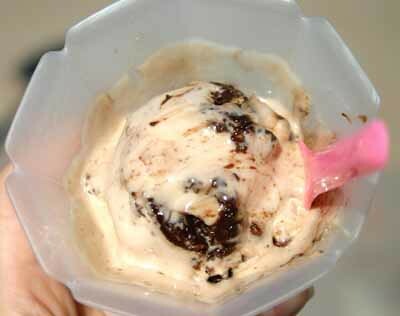 When it comes to Pompei’s, I have a weakness for their Fererro Rocher gelato. Personally, I think their version is one of the best around. I hesitated for a moment before digging into our rapidly melting gelatos and made haste for some respite from our walk in order to take photos before it melted into a milkshake. Aside from getting a little too much of the daily recommended dose of bare flesh, we caught a lot of sun, sand and not to mention shark attacks. Yes, we were treated to a display that managed to capture the attention of literally the entire beach, from the South all the way to the North end of Bondi Beach everyone’s eyes were fixed toward the shoreline. The shark siren had sounded and immediately all swimmers were ushered out of the water. Although, from where we were standing there seemed to be no evidence of any sharks; no fins jutting out of the water, no razor sharp jaws and no suspenseful music, just two jet ski patrollers and a helicopter making a lot of noise and causing more hoo-hah than a bare-breasted sun baker. The "patrolling" went for a good twenty minutes and not one person could tear their gaze from the action at sea. It's like when you slow down at a car wreck, everyone was expecting at least something gory or shocking, although what eventuated was a complete anti-climax. Shark or no shark, it did make for an exciting anecdote to friends afterwards. Here is a rough sketch of what ensued. I am still unsure as to whether there was in fact a shark or not at Bondi, however this did nothing to deter the swimmers from getting back into the sea. This might shock some overseas readers but nothing much will stop Aussies, let alone a shark from swimming at the beach. This could well be the fable of the Beach that cried Shark but I guess after forty years and no deaths from sharks, just from foolish tourists who don't know how to swim, most people will take their chances. Here are Swee’s version of events. 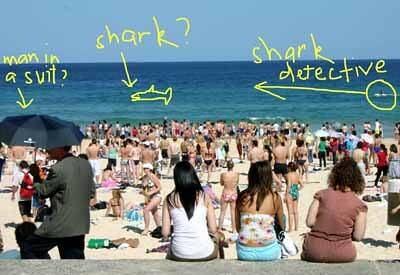 UPDATE: There indeed were sharks at Bondi Beach on this particular day, there were in fact three bronze whalers swiming rather close to shore. This report was found in the Sydney Morning Herald two days later. 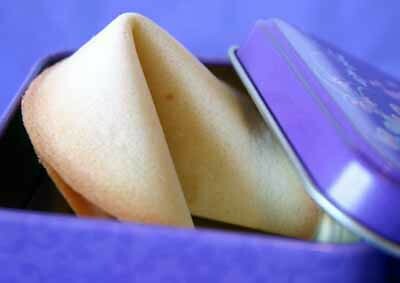 As a child I always wondered how those lovely fortunes came to be inside those little fortune cookies. 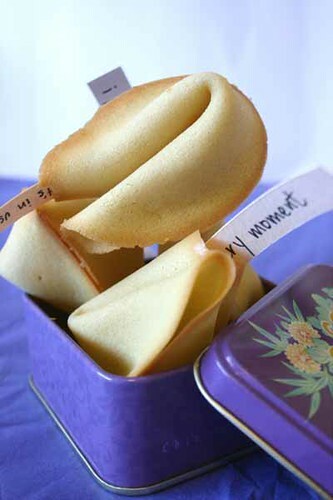 A lady at the local Chinese restaurant would always plonk a bowlful of them in the middle of our lazy susan after each dinner and we would proceed to crack open the cookies to see what our fortunes would bring. Not that our family ever took such superstition to heart, what interested me more than the fortune itself was the baffling question as to how they got inside those cookies in the first place. When you are seven, these are the worst of your quandaries. It was one of those mysteries that just stump you as a kid, much like the mystery of how the fridge light knew when you were going to open the fridge door so it could turn the light on. Was there a little man in there responsible for turning the light on whenever you opened the door, and if so how come we never saw him? How did this man come to be so stealthy and nimble inside the cold fridge? Questions abounded and so did confusion and possibly this is fodder for a future post but strangely, these were the kinds of questions that plagued my mind as a child, and although the man in the fridge question still begs to be answered I am glad to be able to tick this particular one off the list. So how exactly do those fortunes come to be inside the cookies? Well it is by no means from any sort of magic or conjuring, no cute little elves, no Smurfs or Smurfettes; unfortunately there is no legend to be told for getting the fortunes in, someone simply puts it in there. What a way to ruin such romantic and fanciful aspirations for grander explanations. It probably doesn’t compare to the horror you would receive after telling a kid Santa or the Tooth Fairy isn’t real, but what a way to destroy my mythical fancies. However, this apparently logical and somewhat clinical explanation still hasn't quenched my love for the fortune cookie. The thrill of getting a fortune still excites me. It’s the surprise lurking inside and the anticipation of what I will receive that is the exciting thing. It’s not up there with the exhilaration of say bungee-jumping or swimming with sharks but hey, it is the small pleasures that make this life. So maybe I have been making too many fortune cookies; spouting words of wisdom and eloquent revelations really don’t come too naturally. I don’t think these cookies can ever turn your luck, but make them yourself and count it lucky that you were able to do so. Although time consuming, they are actually a lot of fun to make and a great present for someone who needs a bit of good cheer. 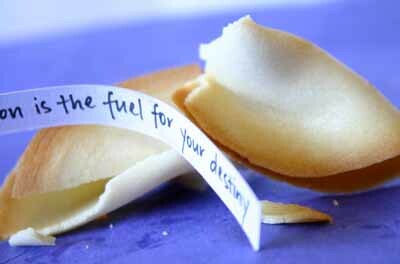 So let the good fortune begin, here is the recipe. Preaheat oven to 200°C. Spray a baking sheet with some non-stick cooking spray. Melt butter in a small sucepan over low heat, set aside. Using an electric mixer, in a bowl, combine egg whites and sugar and beat on medium speed for about 30 seconds. Add flour and salt and continue to beat until just combined. 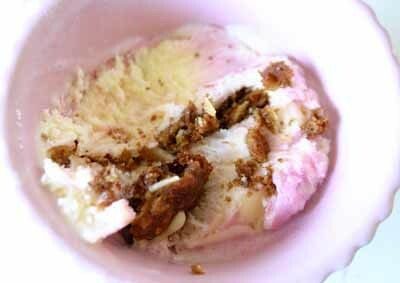 Add the melted butter, heavy cream, vanilla or almond extract and mix until combined. Pour 1 tbsp of the batter onto the prepared baking sheet, using the back of spoon, spread the batter into a a thing 5 inch circle. Repeat this on the other side of the baking sheet. Bake for about 6-8 minutes until the edges are lightly browned. Make sure to only bake 2 at a time as they will make folding them easier. Remove from oven. Working as quickly and carefully as possible, lift one cookie off the sheet. 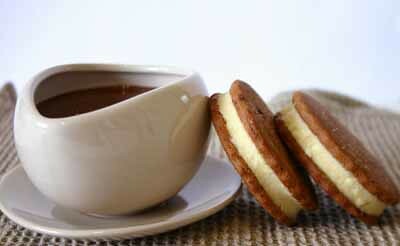 Place a fortune onto the centre of the cookie and fold it in half, pinching the top together to form a semi-circle. Hold the cookies with both hands at each end and using the edge of a bowl as a guide, bending the two ends together, over the bowl's edge. This whole process should take about 10 seconds. 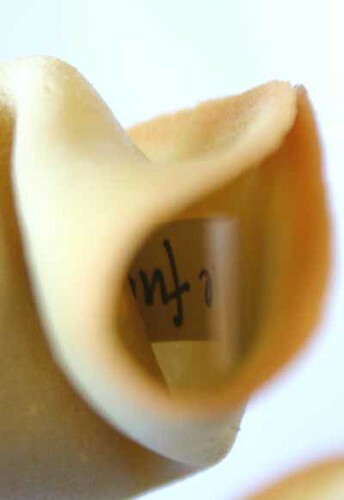 Place the fortune cookie on the kitchen towel to cool, and shape the second cookie. Repeat until all the batter is used up. To speed up the process, bake four cookies at a time, staggering two cookie sheets by 4 minutes to give you time to shape. 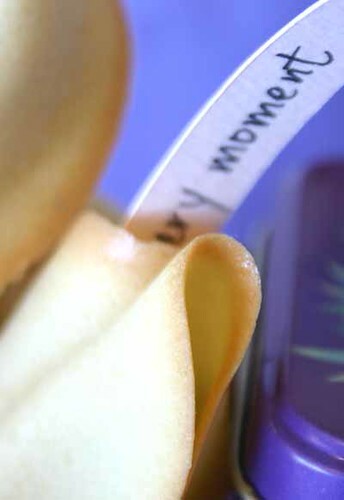 Alternatively you can thread the fortune through the cookie when it has cooled to achieve a different look. These Fortune Cookies are for Sugar High Friday #23; hosted this month by the amazing Alana of A Veggie Venture. Check out the other surprises at the round up coming soon. The party is long over and done with but this party animal has lots of cleaning up to do. Before Cocoa gets stuck into the mess that we created, here are the recipes for all the food that made the festivities all the more enjoyable. 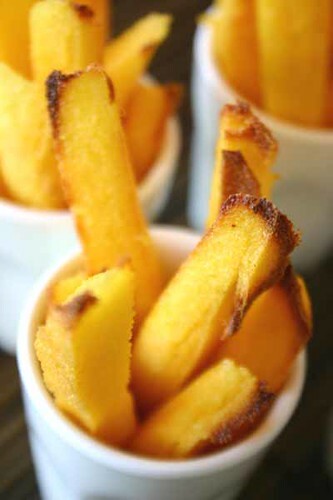 The Cheesy Polenta Fries were a slight variation on Heidi's Baked Polenta Fries recipe here. From past experience, I found out that most kid's like cheese, so to make the fries slightly more cheesy, I used 3/4 cup Grana Padano cheese instead of the parmesan. Very similar to Parmesan, Grana Padano is a well matured, hard cheese. 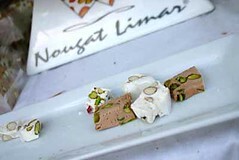 It has slight nutty tones and at times may bear slight hints of olive and strawberry. This cheese is less pungent than parmesan and so would not deter some of the more finicky kids from eating them. 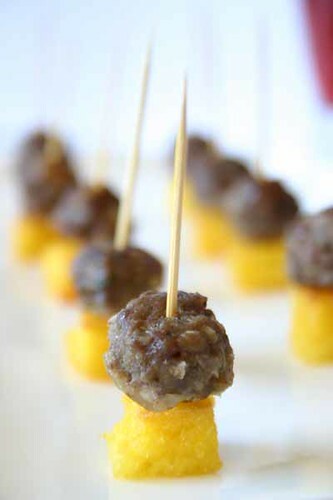 The Polenta Squares and Mini Meatball Sticks were made using the leftover cheesy polenta and meatballs by simply skewering them onto toothpicks for easy eating. A party, especially a children's party is not complete until the kids get to have dessert; be it cake, cookies or ice cream, children love their sweets. Also a kid's party isn't a kid's party until they have been adquately permitted to make a complete mess of themselves. This dessert will not disappoint as ice cream and cookies are the perfect concoction for sticky fingers and soiled clothing. The best thing is that the cookies can be used as a makeshift spoon to scoop out the ice cream, so like I mentioned it's the perfect combination for food, fun and grubby fingers. Preheat oven to 180°C. Prepare two round baking sheet 10-12 inch (25-30 cm) in diameter with some parchment paper. Sift flour, baking powder, baking soda, salt and cinnamon into a dry bowl and set aisde. In another bowl, cream the butter and sugars together. If using molasses cane sugar, you will have some chunks, this is all right. Add the egg and vanilla and mix until blended well. 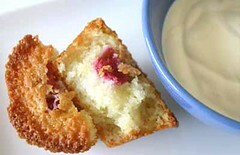 Sift in flour mixture and incorporate with a wooden spoon into the batter. Add the oatmeal and nuts. Drop half the dough onto the middle of the baking sheet and with a spatula, carefully spread the batter evenly all the way to the edges of the parchment paper. Do the same for the remaining portion of dough. Bake in the oven one at a time; for approximately 19 minutes or until the edges are browned. Allow the cookie to cool for 5 minutes on the baking sheet before transferring it to a wire rack to cool further. 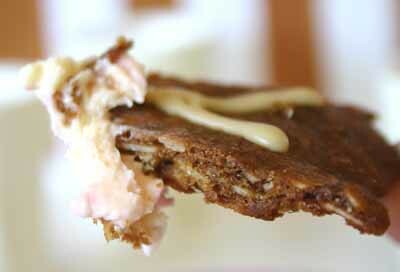 When the cookies are completely cooled, using a large sharp knife, slice the cookie into even wedges. You can get at least 8-12 slices from each cookie. 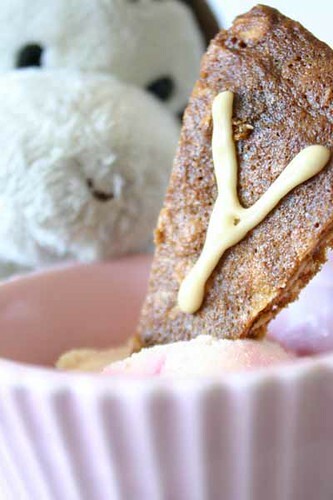 In a small bowl, sift the icing sugar and add the vanilla essence. Add the water 1 teaspoon at a time and add more water is necessary, combine until the mixture is smooth. The frosting should be thick and hold its form. 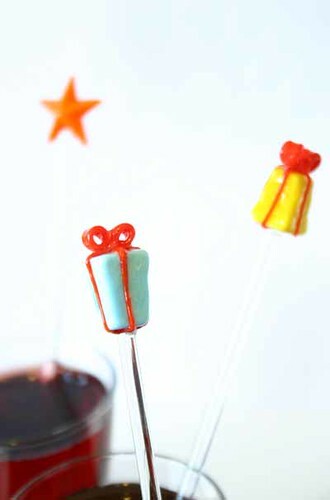 Spoon the frosting into a piping bag fitted with a small round writing nozzle (about 3mm wide). Hold the bag an inch from the cookies at a slight angle and write your message. The frosting will firm at room temperature. NOTES: The cookies can be stored in an airtight container and will last up to two days. Just to keep on the "healthier" side I used several types of unrefined sugars, this recipe can be substituted with conventional sugars. Originally made with blackcurrant liqueur and champagne, this kiddie mocktale made with Ribena will allow your little guests to enjoy a bit of elegant fun. 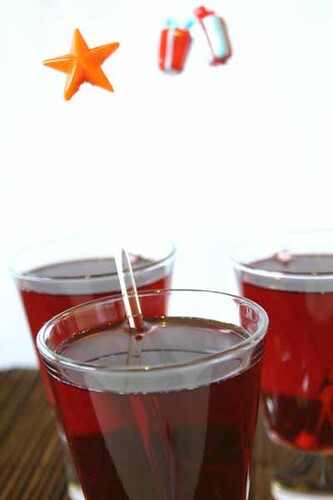 Combine all ingredients in a large jug and pour over ice into small glasses. These mini meatballs are a great size for children. A good way to portion them for kids is to place them into little pastry cups. 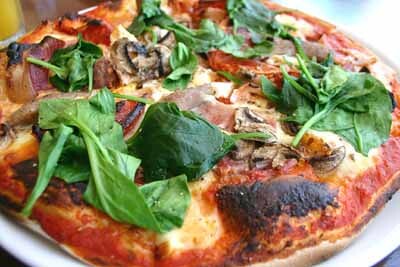 You can use store-bought frozen shortcrust pastry or choose to make your own. 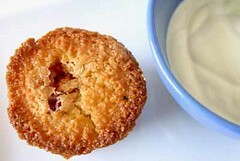 Simply cut out 10 cm diameter circles from the pastry sheets and line a patty cake tin with the pastry dough. Weigh the cups down with pastry weights or rice and bake blind at 160°C for 15-20 minutes or until the pastry cups are golden brown. Remove the pastry weights 10-12 minutes into baking. 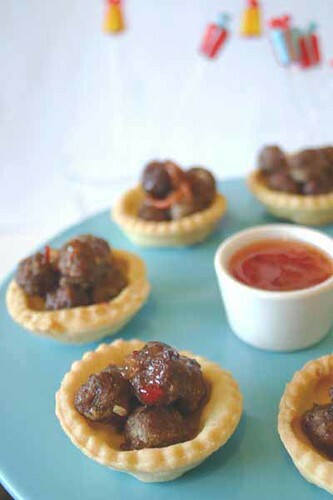 Once you have placed 4-5 mini meatballs in each cup, you can drizzle a little bit of sweet chilli sauce on top. Combine all ingredients in a large bowl and mix using your hands until all ingredients are well incorporated. 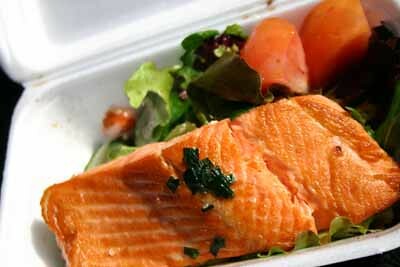 Cover with plastic wrap and place in the refrigerator for 2 hours or overnight if possible. 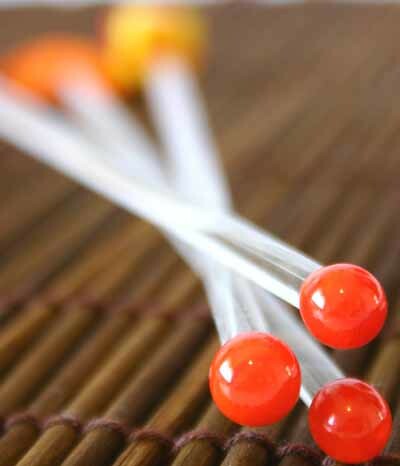 Remove from fridge and roll into 1 tsp worth of tiny balls. Place onto several baking sheets, spacing them fairly closely and drizzle with olive oil. 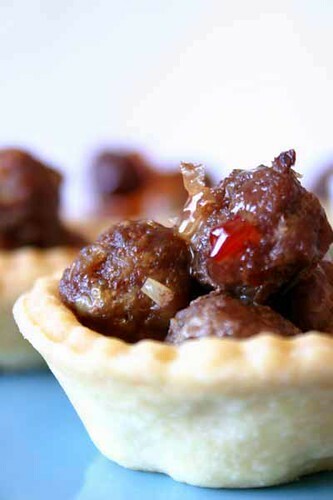 Bake for 20 minutes or until meatballs are browned. Transfer meatballs to a bowl and cover until required. We would like to dedicate this post to one of the best party animals that ever lived, Steve Irwin, whose memorial service was held in Queensland, Australia this morning. As one who lived with such passion and purpose, I know many Australians including myslef will sorely miss him. Crikey, he was one great Aussie and one great human being! I feel the need to engage in a little bit of nostalgic recollection and take you back to the wonder years, when piñatas and Cabbage Patch Kids were all the craze, fairy bread was as cool as the Care Bears and chocolate milkshakes were the drinks of choice. Now you may have kids of your own and are right in the midst of this season of life. But when you don’t have kids, like myself, this type of affair is unfortunately no longer in my social calendar. Since my late teens, I have only attended two children’s parties and they have been for my friend A’s two kids. You see she and her hubby are the only two people in our circle of friends that have had children grace their lives. As for everyone else, we are either single, dating or married, with dogs, cats, fish, and even snakes, but alas no kids. At 24, the audible ticking of my you-know-what-clock is vastly absent, so I don’t think there will be any children in the horizon, just yet. So it’s been a while since I’ve struck a piñata or pinned the tail on the donkey but I guess the beauty of this particular event is that it allows me to relive these memories even if it is only for whimsical pretence. 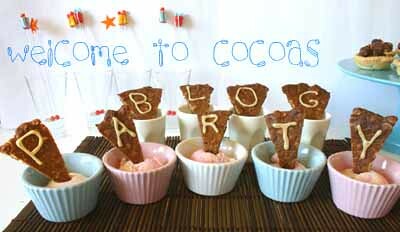 If it isn’t already apparent, I have been enjoying participating in various food blog events of late. I know it’s not every blogger's cup of tea, but being the eager new food blogger that I am, I have been throwing myself into anything that takes my fancy. 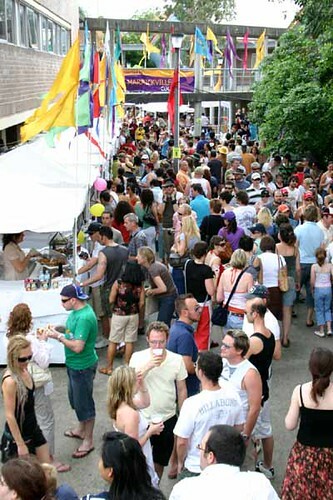 Talk to me when I am 50-kilos overweight and jaded and perhaps my enthusiasm will have waned, but right now my appetite for foodie events is at its peak. 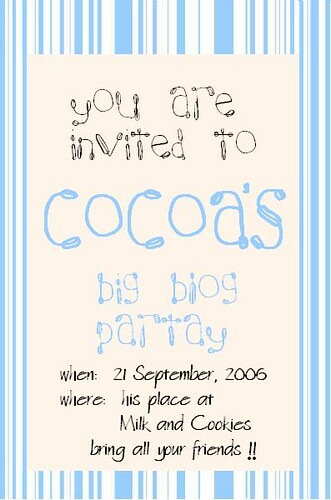 This time it is Blog Party #14 and the theme is kid’s party! So allow me to indulge myself in this fanciful affair, as there is just no stopping the kid inside me. 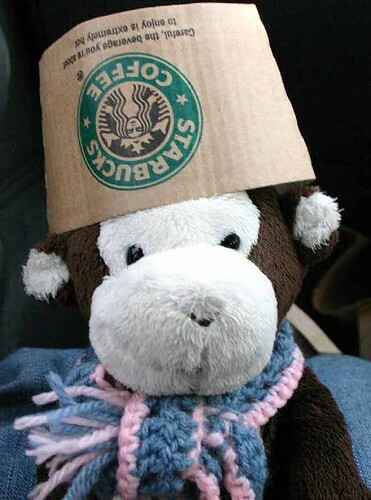 To get in the spirit of the occasion, I decided to improvise with a party for the only kid-type thing in my life other than my dog Jack and to a lesser extent, G. So as far-fetched as it may appear, I am throwing a virtual party for the illustrious Cocoa the monkey, the virtual face of this blog. What’s the occasion you ask? Well let’s just say Cocoa wants to celebrate good food and the good life, which of both things he is a great advocate for. 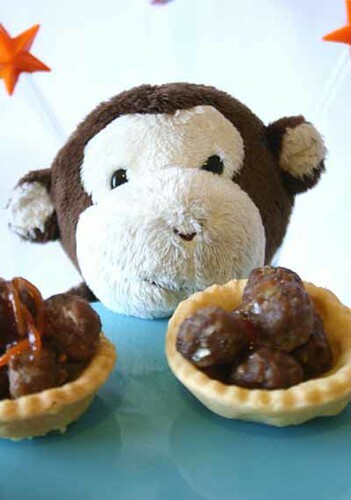 To start, Cocoa served some of his famous Mini Meatballs, presented in little pastry cups and topped with some sweet chilli sauce, they were the perfect appetisers to start off this shindig. Being the considerate host that Cocoa was, he didn’t want his guests to become parched, so as soon as the meatballs were out he also provided them with refreshments. 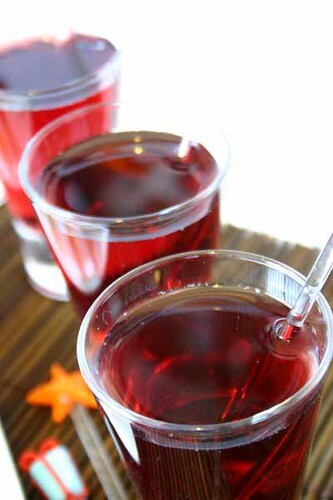 Kir Royale Mocktales to be exact; a refreshing concoction of blackcurrant and sparkling apple juice that surely quenched everyone’s thirst. 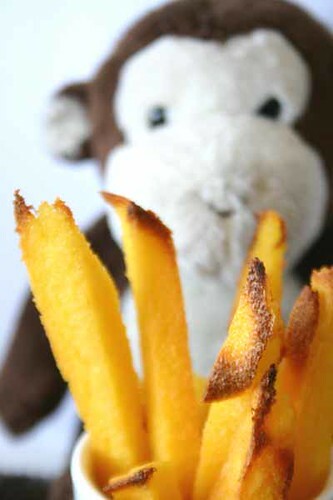 While kids were digging into the meatballs and mock-tails, Cocoa added some Cheesy Polenta Fries into the mix, it was a resounding hit. When asked where he got the recipe, he told them that he got the recipe from the brilliant blog 101 Cookbooks (thanks Heidi for your inspiration, hope you don't mind me slightly mimicking your photos). 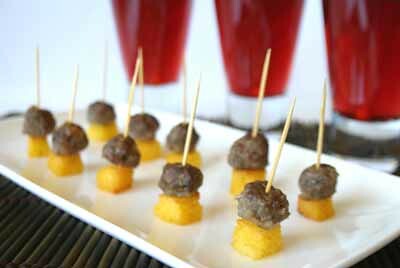 Using the cheesy polenta and mini meatballs, Cocoa switched it up by putting them both on some toothpicks for a quick hit of both flavours. Knowing that a party is never complete without dessert, he ended the festivities with some Raspberry Ice Cream topped with Oatmeal Cookies. 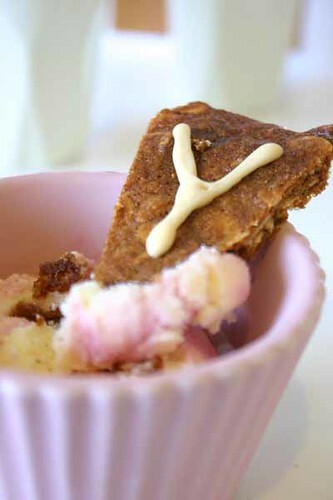 Use the cookies as a makeshift spoon to scoop out the ice cream before it melts. So evidently it seems this little monkey sure knows how to throw a partay. Let’s not talk about the clean up afterwards, but let’s just say that everyone left having had a great time. Recipes will be coming soon, but make sure to check out the Blog Party roundup at Stephanie’s delightful blog Dispensing Happiness. My body had gone far too long without its daily recommended intake of Vitamin-D, so G felt a sense of duty to take me out for a weekend of sunshine and shopping. 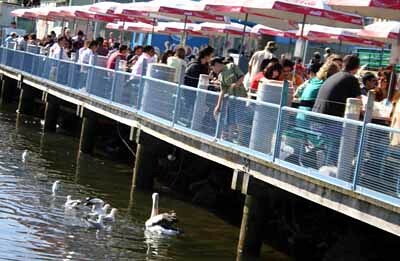 After already braving the masses at both Glebe and Bondi markets, we decided to make a trifecta of it and defy all better judgement and head to the throng-infested Sydney Fish Markets. Now to be utterly cliché, Sydney Fish Market is an institution, almost like a rite of passage to experiencing quintessential Sydney. 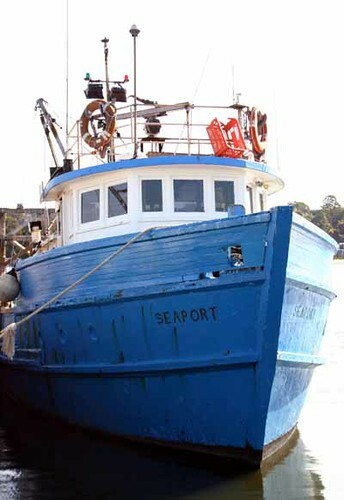 Being surrounded by such a beautiful and bountiful harbour, it is only natural that Sydney should boast one of the world’s largest fish markets. 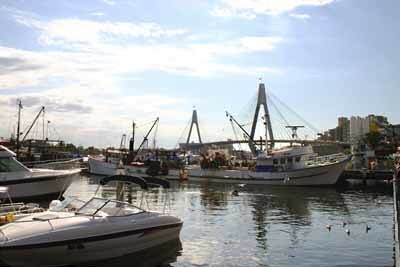 With a range of seafood only second to those of Japan’s markets, the SFM is a mandatory visit not only for tourists but for Sydneysiders alike. Just make sure you don’t come on Christmas Eve, there is no guaranteeing you getting in or out, for that matter. Unlike the weekend of torrential rain and gale force winds we just had, this weekend was the polar opposite; sunshine abounded and not a drop of rain was to be found. Unfortunately when the weather is good, you and the rest of Sydney will decide to head out and enjoy every last bit of it, so not only was the sun out, but everyone else was too. As one who is vehemently allergic to crowds and prone to adverse fits of irritation when it comes to enduring them, I was reluctant in making our way to the markets. 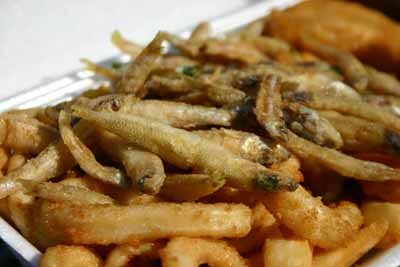 You might think, hey these are only fish makets, how crowded can they be? Do not be deceived, these crowds can get to Disneyland proportions and when there are immensely hungry people in the mix, this can become a cockatil for disater. So all I am saying is there will be lots of people, beware before you go for a visit and get flustered by the amount of shuffling and waiting you will be doing. 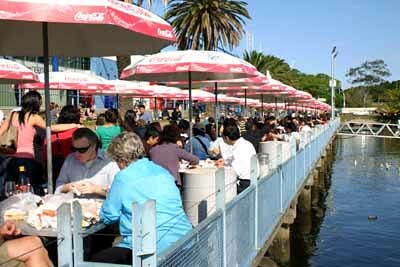 Crowds considered, the prospect of getting my hands on some fresh fish and my favourite, fried whitebait, was much too strong to disregard. Giving into my crowd-repulsion, paid off when we finally got our hands on the hot little fishies! 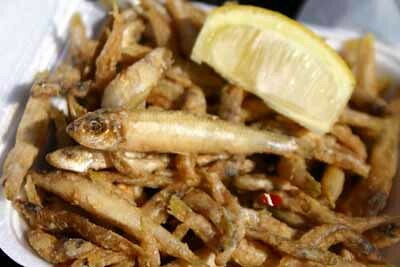 Whitebait, I think are so cute, and there is something terribly unnerving about finding pleasure in eating them. 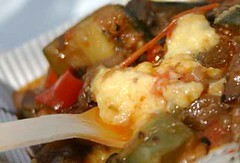 Albeit their visual charm did not surpass their gastronomic appeal, and my appetite. More whitebait... this came with the seafood basket, the calamari, prawns, fish cocktails, baby octupus, mussels, scallops and fish were all underneath. The pelican and seagulls, getting a free feed. 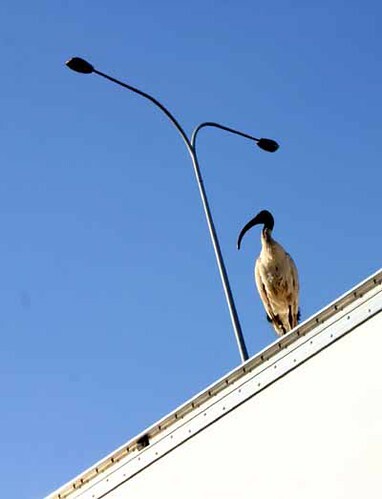 An Ibis cunningly peruses the scene from atop a fish truck. 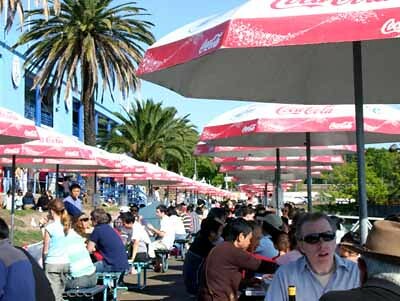 Located at Bank St, Pyrmont, on the Blackwattle Bay foreshore, the Sydney Fish Markets are open everyday from 7:00am, except on Christmas Day.